A day trip to the Getty Villa (1) up in the Pacific Palisades followed by a late lunch at Gladstone's (2) for seafood right on the beach. I recently discovered that there were two Getty Museums in California. One is the Getty Museum in L.A. and the other is the Getty Villa in the Pacific Palisades in Malibu. Perched on a hill, the Villa is the original J. Paul Getty Museum. The Villa is modelled after a first-century Roman country house in Italy. Everything about the villa is influenced by ancient Greece, Rome and Etruscan cultures.The villa started out as a private residence for J. Paul Getty and his massive collection of art. As the collection grew, J.Paul Getty had the idea to build a museum as an extension of the villa. Unfortunately, he passed away before he could see the finished Villa. Today it houses a permanent collection as well as hosting many changing exhibitions. The Inner peristyle at the centre of the J. Paul Getty Museum. The Getty Villa currently houses over 44,000 Greek, Roman and Etruscan antiquities. So, there's plenty to see. The collections are spread over several galleries and arranged by theme. I started off by watching a short film explaining the history of the Villa.Then I made my way around the galleries which are on two floors.I really appreciated the ambience of the gallery. It was not overly crowded and you could walk around at leisure to admire the many pieces of art. There are 23 galleries housing the permanent collection of Greek, Roman and Etruscan antiquities. As a big garden lover, I couldn't wait to make my way out to the gardens. 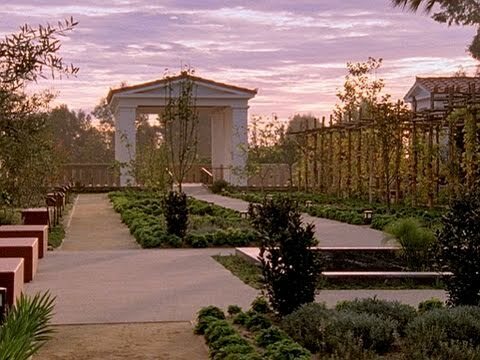 Just like a traditional Roman house, the Getty Villa grounds are surrounded by beautiful gardens including an Inner Peristyle, a Herb Garden and an East Garden. However, the main attraction has to be the Outer Peristyle with its 220-foot-long reflecting pool surrounded by plants and sculptures and a covered walkway with wall paintings. It really is beautiful. I highly recommend a visit to the Getty Villa to fully appreciate the scale and beauty of the place. Admission to the Getty Villa is free and there is a parking fee of $15. My favourite spot -the outer Peristyle with its reflecting pool and gorgeous plants surrounded by a covered walkway.